I have a lot to look back on this year. Personally, in 2015 I saw major changes in my workplace and my family grew from a pair to a trio. On the web, the blog has been covering a good balance of currently under construction projects as well as ones in the planning phases. I’ve found that transit and developments are my go-to topics. I enjoy following the downtown eats scene as well. I want to try and share a little more history in 2016 and not just old photos. Trends are important to point out and with Raleigh changing so fast, important facts from history as recent as a decade ago could be relevant. Let’s recap on a few things we talked about this year and how it’ll lead into the next. 2016 could be the year that Wake County gets more serious about mass transit. With a new plan in place, created through an extensive public feedback process in 2015, we have our strongest proposal yet to ask residents of the county to tax themselves in order to pay for this new transit plan. It is expected that our county commissioners will propose a half-cent sales tax increase, dedicated to transit, to be added to the November 2016 ballot. According to the plan, downtown Raleigh is a major hub of higher-frequency buses. New and improved routes would be set in place as well as an increase in destinations compared to our current network. The Moore Square Transit Station should be quite busy. 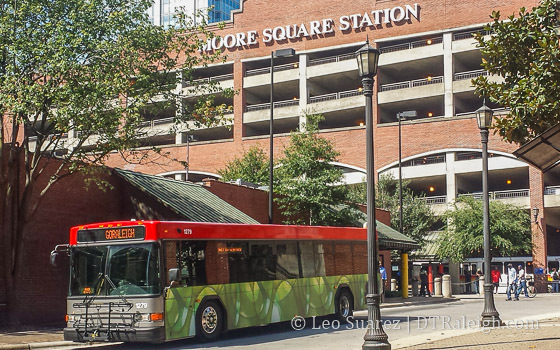 Speaking of Moore Square, the bus facility there should be getting a major face lift. Still in the planning stages, the upgrade of Raleigh’s busiest bus terminal will hopefully move forward in 2016. Along with Moore Square, Raleigh Union Station should begin construction in 2016. Not only is the expansion of the train station needed for Amtrak but also for the proposed commuter rail line that may happen as part of the previously mentioned transit plan. Expect this blog to be very pro-transit in 2016. 2015 had a few developments in the works but there were also some new ones to follow that worked their way through the approval process. In 2016, we may see cranes in the air for these new buildings. The Lincoln, Skyhouse Raleigh, Elan City Center, and The L were all completed in 2015. These buildings add several hundred new apartment units to the downtown supply. That’s not all though as we have plenty coming down the pipe. The Link Apartments should have residents moving in sometime in early 2016. The Edison Apartments are coming along and should be done in the first half of 2016. The townhomes at Blount Street Commons are mostly finished and should have residents moving in throughout 2016. 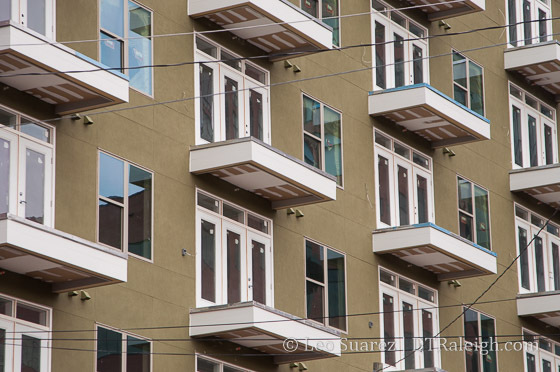 The Gramercy is mostly built out and I see no reason it’s not up and running in 2016. That’s several hundred more apartments being built and ready to be opened next year. In the planning phases are apartments as part of The Dillon, Greyhound Apartments, and the north tower of Charter Square. Outside of residential developments, some taller structures containing offices or hotels may be breaking ground in 2016. Those to look out for is the main structure of The Dillon, a 17-story tower in the warehouse district. Charter Square North is planned to be a 22-story mixed-use building with offices and residential. Maybe it will break ground in 2016? Other notable projects are The Edison Office tower and Narsi Hotel, a 12-story building for the corner of Lenoir and Wilmington Streets. In 2015, these projects worked their way through the planning process so we’ll continue to follow them into 2016. As mentioned recently, construction on the Residence Inn hotel near the convention center has started. Personally, I’ll be interested to see what comes out of the work being put into the 301 Hillsborough site and the N&O block. I expect to see lots of planning take place in 2016 for these sites. One last mention, kind of long shot but perhaps something interesting could happen, is Project Phoenix, the North Carolina governor’s plans for bringing development to the state government complex. Nothing sounds concrete yet from what I’ve read but the idea of turning the expansive complex into a more mixed-use environment would be a fantastic benefit to downtown Raleigh, essentially growing the footprint of interactive space. They may not be favorites but they at least got the most web traffic. Here are the top five posts of 2015. Readers shattered my single day page view record this year. It was on the topic of the sidewalk seating ordinance, an emotionally charged and even political topic of the year. The elections of 2015 can only be described as DrunkTown. I hope to look back on this debate years from now and just laugh. To close, I end with one bold prediction for 2016: The R-Line makes it’s last loop around downtown Raleigh. That’s a great summary of all the exciting projects to look forward to in 2016! One thing I haven’t heard anything about in quite awhile: Stones Warehouse? Is that project still moving forward? Jeff, absolutely. Actually, just a few days ago, a site open was submitted to the city for Stone’s. It shows kind of the layout of the parking lots and townhouses but not much else outside infrastructure. Are there any plans or recommendations of what should be done with the R-Line? “the corner of Salisbury and Wilmington Streets,” huh? How, uh, enigmatic. Just teasing. Thanks for all you do, Leo, and have a splendid new year. Ha! Thanks a lot for catching that, Tom. Happy New Year, Everyone, Let 2016 be the Year that we see more Developments in Downtown Raleigh. Thanks Mark ! Happy New Year To You ! 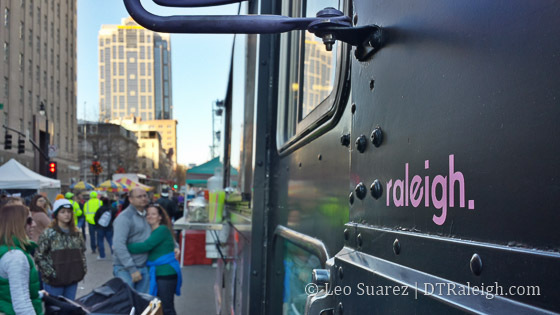 “Go 2016 Downtown Raleigh” ! Thanks for such an entertaining and informative blog Leo! It is very appreciated. So the Lundy Group is planning to spend 160 million on the Hillsborough lots, two 20 story towers, one residential and one office. Will they be twin identical buildings, maybe 300 ft? William , The way that I understand the city code is that a 20 story can not be more than 250 ft. tall & a 40 story can not exceed 500 ft. I have e-mailed the city council about this using Charter Square North as a example 22 / 23 stories @ 316 ft. tall , but they still passed the new code . I am not sure if a developer can request above the 250 / 500 ft. guidelines or not . I was thinking the Edison was going to be 290 with only 19 stories. Kinda crazy. Thanks Stew for the info. Happy New Year ! @William, 290 feet for 19 floors of a commercial spec building isn’t that unusual if one is measuring to the top of the roof’s parapet walls or ornamental crown. The typical floor to floor height is taller in commercial buildings than in residential ones. Given 290 feet and 19 floors inclusive of, perhaps, a higher first floor ceiling and building crowning would probably make the floor to floor distance about 14 feet…totally reasonable. John, I realize that, but we were talking about the city’s new height restrictions for a 20 story building is 250 ft. and the last height I have seen for the Edison is 290, which I like. No doubt that the developer could get height extensions approved. It’s just a matter of what stipulations the City would leverage. Like trying to get a set amount of affordable residential units that they screwed themselves over by not including any requirements for affordability during the sale process. According to this PDF found on the raleighnc.gov page, the Edison should be around 301 feet: http://tinyurl.com/gr6lpfn (clicking on the link opens the PDF). The UDO is the “baseline” requirements for development. It can be construed as a fast track because it clearly lays out the city expectations in policy form. It is meant to cut red tape by clearing much of the development hurdles (rather than pushing developers to this committee or that). However, just because it is in policy form does not mean one cannot apply for a variance. If a developer wants to put a 100 story tower on Hillsborough Street, they are allowed to apply for a variance against said conditions of the UDO and fight it out in the planning commission and city council meetings. I dream of tall iconic buildings myself. I am happy that tallish buildings such as these and the Dillon are in the works. They will add to SECU, Quorum, the West, Round Hotel, and the Archdale to give us more tall buildings off The Fayetteville St area. If these projects keep coming along, it won’t be too long before you can walk for blocks and blocks in down town and be completely entertained by the atmosphere! The UDO may be a baseline for development, but it has effectively limited the growth potential of downtown. Developers are not going to subject themselves to the heightened scrutiny and rampant NIMBYism that has taken over downtown. The only time I can see a developer willingly subjecting themselves and their projects to such a process is if they have paid an exorbitant amount of money for their property and will not be able to reap any kind of reward for developing the property without going above the height limits. Will the UDO result in more construction downtown? It’s highly likely. What will that construction look like? My guess is that it will mostly be what we’ve seen tons of already, ugly, stick built apartments that are designed to last a few decades and then be torn down. A perfect example of what we should expect more of under the UDO is the pic of the week from Dec 2. The UDO encourages a lowest common denominator approach to development. It’s like the municipal version of basic b****ery. Wholeheartedly agree with Brad. What for-profit company is going to spend a year fighting NIMBYs to get an extra 5 floors on a building? The UDO got it backwards. The lower limit on sites in these areas should be 20 and 40 stories, not the other way around! Also, as far as affordability requirements…. I support affordable housing, but if someone making under 30k per year is living in a luxury high-rise downtown while the rest of us live in the outskirts, that is the wrong approach. Affordable housing doesn’t mean a select group of housing lottery-winning poor folks get to live in luxury, high-demand towers. It means that affordable communities are planned. I still think there is room for high rise towers that cater to the relatively wealthy if needed, but enhance our skyline (even if I would never be able to live there). The problem with the UDO limits is that the amount of vertical distance allowed per floor generally decreases as the corresponding number of floors increases. Under the UDO, you can build a 3 story building with a maximum height of 50′ (nearly 17 vertical feet per floor) but a 40 story tower is only allowed an average of 12.5′ per floor. In fact, all buildings 12 floors or above are only allowed 12.5 vertical feet if one maximizes the floor count. The reality is that no high rises will be built except residential towers that will maximize both height and floor count. That said, even the PNC tower is over 500′, has many floors of residential, and it still falls 7 floors short of 40 floors. Speaking of transit, I found this 1987 report from the North Carolina Department of Transportation and the Urban Mass Transportation Administration entitled “Travel in the triangle : trends, implementation, choices” to be rather amusing. Check out pages 101 & 102. Leo, thanks for your website. This coming Tuesday I hope to make a 3 minute pitch to City Council for 20 mph speed zones in our Raleigh neighborhoods. Do you know if there is a `20 is Plenty’ organization here in Raleigh or in the Triangle?